Slag pot Introduction With richly experience and advanced casting equipment, CHAENG has the capability to offer slag pots (slag ladles) in nearly every shape and style for a variety of mounting systems and transport methods, according to customers’ drawings, utilized in BOFs, AODs, Electric Arc and Blast Furnaces, and so on, suited for a number of processes, such as lead, aluminium, iron, steel, chrome, manganese, copper and other smelting applications. 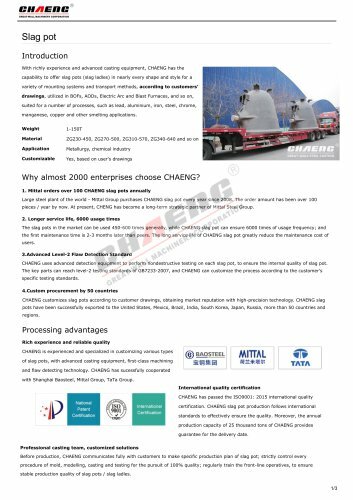 Weight Metallurgy, chemical industry Yes, based on user's drawings Why almost 2000 enterprises choose CHAENG? 1. Mittal orders over 100 CHAENG slag pots annually Large steel plant of the world - Mittal Group purchases CHAENG slag pot every year since 2008. The order amount has been over 100 pieces / year by now. At present, CHENG has become a long-term strategic partner of Mittal Steel Group. 2. Longer service life, 6000 usage times The slag pots in the market can be used 450-600 times generally, while CHAENG slag pot can ensure 6000 times of usage frequency; and the first maintenance time is 2-3 months later than peers. The long service life of CHAENG slag pot greatly reduce the maintenance cost of users. 3.Advanced Level-2 Flaw Detection Standard CHAENG uses advanced detection equipment to perform nondestructive testing on each slag pot, to ensure the internal quality of slag pot. The key parts can reach level-2 testing standards of GB7233-2007, and CHAENG can customize the process according to the customer's specific testing standards. 4.Custom procurement by 50 countries CHAENG customizes slag pots according to customer drawings, obtaining market reputation with high-precision technology. CHAENG slag pots have been successfully exported to the United States, Mexico, Brazil, India, South Korea, Japan, Russia, more than 50 countries and regions. Processing advantages Rich experience and reliable quality CHAENG is experienced and specialized in customizing various types of slag pots, with advanced casting equipment, first-class machining and flaw detecting technology. CHAENG has sucessfully cooperated with Shanghai Baosteel, Mittal Group, TaTa Group. International quality certification CHAENG has passed the ISO9001: 2015 international quality certification. CHAENG slag pot production follows international standards to effectively ensure the quality. Moreover, the annual production capacity of 25 thousand tons of CHAENG provides guarantee for the delivery date. Professional casting team, customized solutions Before production, CHAENG communicates fully with customers to make specific production plan of slag pot; strictly control every procedure of mold, modelling, casting and testing for the pursuit of 100% quality; regularly train the front-line operatives, to ensure stable production quality of slag pots / slag ladles.